The Shamrock Shuffle, an annual 8K race in Chicago’s Grant Park, has a special meaning for the Maxwell family of Barrington. 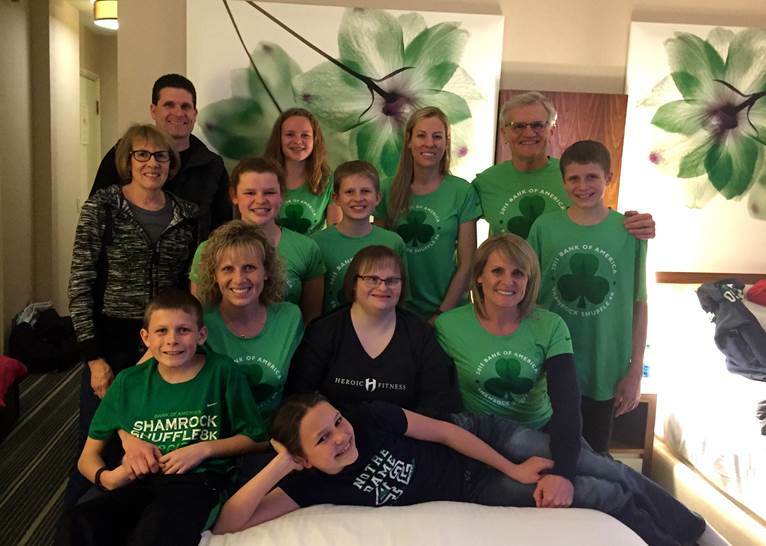 Joe Maxwell, left, and members of his family ready for Shamrock Shuffle. Daughter Christine is at front. Patriarch Joe Maxwell began running the race in 1986. Little did he know then that almost 30 years later, the race would have grown into the seminal event that kicks off Chicago’s running season. Maxwell also had no idea that by 2015, his daughters, nephews, nieces and grandchildren would be joining him for this springtime tradition. Maxwell said there are several races, mostly in Chicago’s suburbs, that he runs in with his family. “We’ve been doing it as a family for 15 years; someone’s always jumping in,” he said. Christine Maxwell, left, holds the finish line banner. 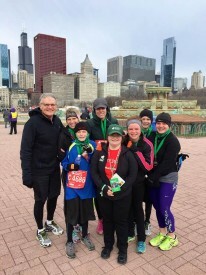 This year’s Shamrock Shuffle had a particularly special meaning for the Maxwell family as Joe’s daughter, Christine, who is a Special Olympics athlete, had the honor of cutting the finish line tape and presenting the medals to the winners. 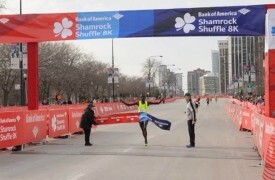 Christine Maxwell also said it’s great to have Bank of America partner with Special Olympics, promoting events like the Shamrock Shuffle. Bank of America’s partnership in the Shamrock Shuffle is part of the Unified Relay Across America, in which the Special Olympics Flame of Hope is carried in all 50 states.